Polenta is one of my favorite ingredients mostly used in savory dishes. Each time a recipe calls for polenta, I am all ears (and eyes too). A few weeks ago I made Zaletti, polenta cookies. Grease the 9 inch spring form pan with butter and dust with flour. Grate the zest from the lemon and orange (and the lime, if using). Combine together flour, polenta, baking powder, and salt and set aside. In the bowl of a stand mixer whisk together eggs and sugar until they are pale yellow and more than doubled in size. Add citrus zest. I also added a juice of a whole lemon. Add dry ingredients in small batches alternating with olive oil: one third of dry ingredients followed by half the oil, then add another part of dry ingredients, then olive oil, and finish with adding last part of dry ingredients and beat only until each addition is mixed. Transfer the batter into the prepared pan, smooth the top. Bake the cake 25-30 minutes. Test the cake by inserting a wooden stick (I use a bamboo skewer) comes out clean. In a stand mixer whisk all ingredients for 2-3 minutes. Brush the cake with the orange juice (more juice will make cake more moist, so you decide how much of it to apply). Cover the cake with the filling, and decorate with your favorite berries. Please, note: to make two layered cake as the one on the photo double the ingredients and bake two cakes. I love the sunny color and the citrus taste of this cake. Because I am not a sweet eater, I always reduce sugar to 1-2 tablespoon from what the original recipe calls, and even then sometimes it is too sweet for me. 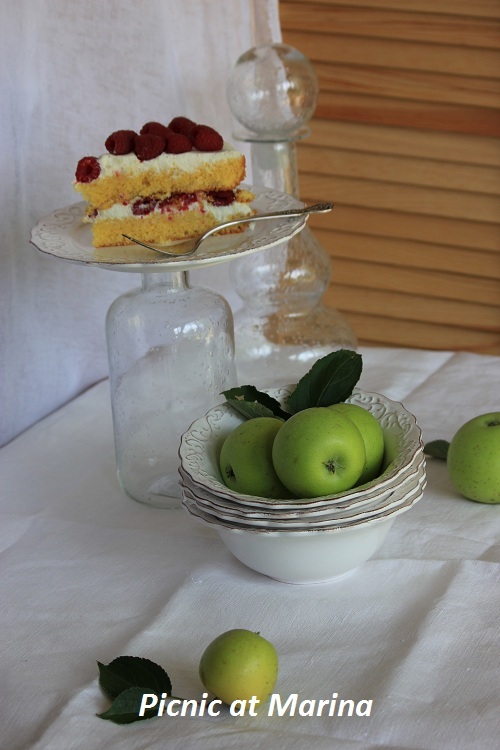 To bring down the sweetness, I dress my cakes with fruits and berries. I haven't eaten sweets for about 20 years, from when I was 3 years old. Nothing, no candies, no ice cream, no cakes, no chocolate. I hated all that stuff, and it was a torture when during my school years at some party I was given a slice of cake to try. My very first sweet bite was when I was at the university, during the summer exams. That day I had a four hours long written exam, and was walking back home, all brain tired, heat exhausted, and hungry. As I was walking by a candy store my head suddenly started to spin from the smell of... chocolate? candy?.. . My feet brought me inside without my approval, but I was happy to be there and I bought four chocolate bars! My mother met me at the door when I came home, concerned about my exam. I dropped myself on the couch, lifted my daughter up (yes, my friends, marriage, kids, work and university all happened at the same time), and told my mother all details she was so interested about my exam, completely forgetting about the chocolate. My then little daughter, unlike her mother, loved all things sweet (and still does). She didn't hesitate to unwrap what was left on the kitchen table: all four chocolate bars (apparently, what I thought of shoveling was a very modest nibbling) and covered herself, some walls and furniture in a cute chocolate "mask". Yum! I love you beautiful cake Marina. It looks so good... plus the presentation is so stunning! one of my sons never really got into sweets either--as a young boy he would much rather have a salad than candy---this cake looks beautiful! Fruits especially berries make everything tastes good. I baked a quite similar birthday cake for my husband using berries and soft ricotta cheese but without polenta. He is also not a sweet eater and even I always reduce the sugar from what ever the original recipe asks. I have to try this polenta cake. Thanks Balvinder! Let me know if you try this cake, although it is not gluten free. This cake looks so good! I will have to make it one day! I go back and forth between liking something sweet for a few months, and then not eating anything sweet...sometimes for a year. Right now I still have a big sweet tooth. I do like sweets - and wish I didn't. Too easy to overeat. But we often reduce sugar in recipes, like you, because we also find too many that are over-sweet (although in some that's rather nice). Nice story about your exams, mother, daughter, and chocolate. I used to hate those long, long finals. Good read - thank you. I never would think to use polenta in a cake. That cake looks so so good. I love sweets! I love the sound of this cake, I'm a citrus freak! looks divine!! I love polenta and this cake is made to perfection. Beautiful and very very nice. Brava! Happy birthday. This is my kind of cake - I love citrus flavours! Thanks for sharing your recipe. Like you idea of reducing the amount of sugar called for in the original recipe. I too prefer a less sweet cake and pastries. Happy Birthday Marina. This cake sounds wonderful and I like that addition of polenta. I see you cut way back on the sugar and I bet it still tasted great. It really looks tasty. I'd make it two layers also just to get extra of that dreamy filling, LOL. I'm not a big sweet eater either! This looks delish and right down my ally. I love polenta very much too. I thought I'd like the cake just by its title. Seeing the pictures really won me over. This is my kind of birthday cake! Fantastic looking cake Marina. Sandwiched together with the fruit there, well, it's just picture perfect! Incidentally, it's strange what you say... it's true... everyone's different. Everyone I know seems to love candies, like things like gummy bear things, red shoelaces, liquorice etc... Yuck, is all I can say. The only kind of "candy" I'll eat is good chocolate. You're like me, when I find a really good recipe I make it a few times i a row! This looks amazing, I use polenta in savory recipes but not much for sweets - I will have to try this! This sounds so good. I am yet to try polenta in baking but will have to try it! Happy birthday Marina! The cake looks amazing! 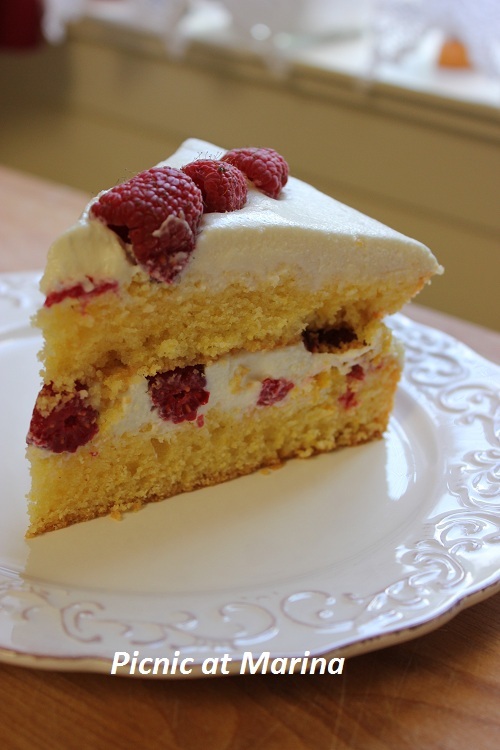 Marina, sorry, that I totally missed this beautiful polenta cake with the fresh berries. 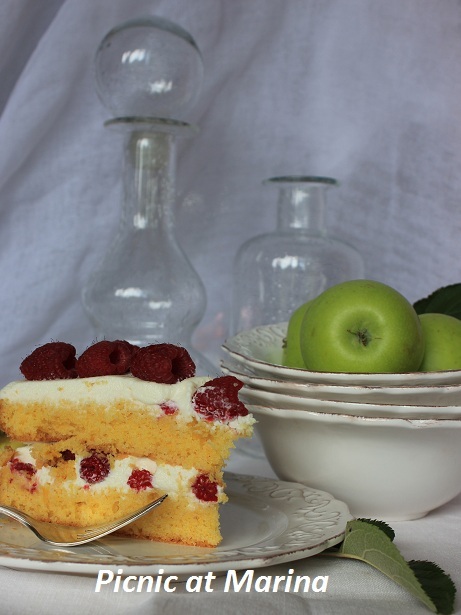 I love, love polenta cakes, and your take on it with the luscious cream, and the berries is awesome, and very delicious! LOVE the new polenta cake - it's so pretty, like a Victoria sponge.